However, the years went by and I didn't sew. Pants needed to be hemmed and I asked my mom to do it because "she knew how." I got married and my husband needed his pants hemmed. Guess where I went? My mom helped me and my sister this way for years. After all, she had the machine. We were busy. She didn't really seem to mind. But one day, she announced that she thought it might be time for us to learn (re-learn) how to sew so that we could repair our own family's clothing. She might have said something about needing to know this skill because someday she might not be around. She might have...but whenever my parent's talk that crazy talk about them not being here someday, I go into 2-year-old standing with the fingers in my ears mode. Some of that talk registered though. I was feeling bad about bringing my piles of mending over to my mom and dropping them off like she was my seamstress. Not too much later, I was browsing the end caps of Target and my eye fell upon a sewing machine. It was a basic Singer model on clearance for $35. Now, I didn't know about sewing machines, but I knew it was a great price. So, I put in my cart. Then I unboxed it and put it in my closet. I mentioned my purchase to my friend, Sarah, who is a gifted seamstress. She agreed to hold a series of basic sewing classes over the summer. And the rest is history. I want to reiterate that I am a sewing novice. I have learned how to thread my bobbin and put it in the machine, to thread the machine, to sew a straight line, and to change needles, tension and stitch length. I can even trouble-shoot my machine a bit. But, I am still tentative when I sew. I'm not completely sure of myself. However, I am pretty satisfied with what I've learned and how I've used it to make our family's well-being better and a bit more frugal. Now, instead of throwing out ripped up pants, I know how to trim off the ripped portion and hem the pants into shorts. I can do minor seam repairs and even cut down a dress from my 8-year-old to fit the 5-year-old. And yes, I can hem pants and jeans. My mom was so encouraged by my progress (or maybe she was just relieved to not be sewing so many extra garments) that she decided it was also time for my sister to learn/relearn. Pretty soon my sister was taking piles of her family's garments over to my parent's house and using my mom's machine. And recently, she received her very own bright and shiny sewing machine for Christmas. The whole thing has me thinking about how we as a culture -- and especially as women and mothers -- have really gotten away from sewing as both a skill and necessity. It wasn't too long ago that clothing "off the rack" was more than anyone could afford. If you wanted curtains in your living room, then you had to choose your material and get to work. Nowadays, you can pretty much buy those things cheaper than you can make them (which I think is a sad comment on our consumerism society) which had caused sewing to go the way of the RSVP. But, much like that antiquated but highly appreicate social grace, I honestly believe that sewing is still relevant and still has a place in our households. And, it appears I'm not the only one who thinks so. Sewing is on the rise. 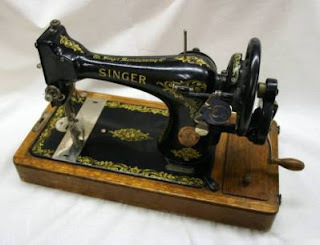 Check out this fun blog post from the UK about their resurrgence and some history of the sewing machine. I may never have the natural gifting and talent that my friend Sarah has with sewing. I'm okay with that. I can always commission her to make what I cannot...or I can ask her to teach me and practice. But, beyond that, I think it's important for me to know the basics so that if it ever came to it (apocolypse, embargo of products from China), I could keep my family clothed and my house arrayed in window treatments. I actually think that this is something we should all know. It's a skill. It's a craft. It's an art. And it makes frugal sense -- which if you haven't guessed, is usually one of my bottom lines. Take for instance this pair of jeans that I am excessively proud of "rehabbing" (just ask my family...they will tell you that I've made them all listen to the story). My children -- much like yours -- are very hard on clothing. I've resewn on buttons and clasps, repaired tears, made cut-offs, and of course, hemmed pants that were too long, frayed, etc. But this pair stumped me. My daughter had somehow taken her months old jeans (that I scored at Target for $4.34) and ripped a large "L-shaped" tear into the upper thigh. I could not see my way around to making them into cut-offs unless I wanted my 8-year-old to be sporting Daisy Dukes. And so, I decided to patch them from the inside. Then I bought a large fabric applique/patch and sewed it around the edges. And...voila! Rehabbed pants...ready to be put back into service. Really...if I would have known how much satisfaction I would get from taking care of my family in this way...and just the overall sense of accomplishment...I would have done it years ago. So, take it from me. If you are thinking about joining the world of sewing, jump on in...the water is fine.